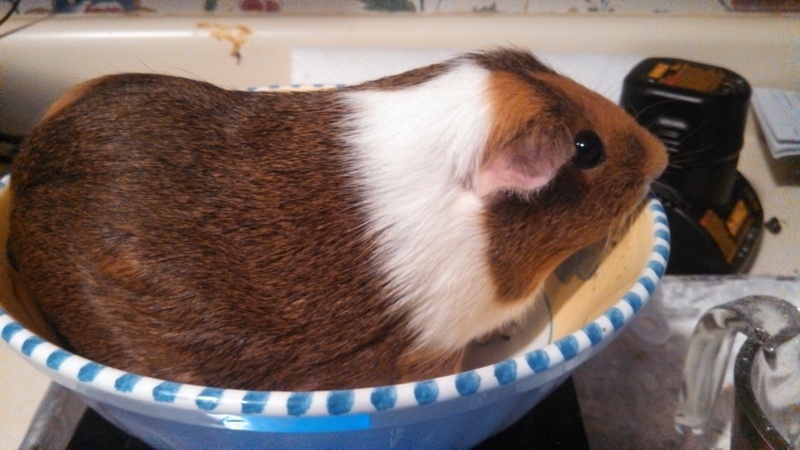 Even though i have several Guinea pigs, there are a few that stand out as my favorites. Most of these pigs will run up and greet me, wheeking loudly for food and love. They would beg me to scratch their ears, bounce whenever I come near, and love nothing more than to cuddle on my lap. These are the rarest of Guinea Pigs, as most pigs are very shy… Out of all my pigs, Butters and Cadbury were my most outgoing. Sadly, this weekend I was moving Virginia creeper vine (nobody knows its exact toxicity, but research said that 12 of its berries killed a guinea pig in three days…) and I dropped a bunch of it next to the cage as I was hauling. Cadbury, who loved pacing back and forth with me along the cage, managed to reach through and grab it. She only got to one young leaflet of five, but within 24 hours she stopped eating, drinking, and pooping. I brought her inside to her own comfortable cage, and tried to get her to eat, but she was so lethargic (which DID make her cuddly). But, if it was a URI, they are majorly contagious. So everyone is getting extra hay, and fresh greens to boost the immune system, and I am being hyper vigilant for issues. And chores without you aren’t the same.